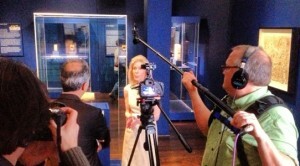 The Cyrus Cylinder U.S. Tour 2013 – A short film from Iran Heritage Foundation The IHF contracted Julye Newlin Productions which hired Citizen Doug Productions to record two days at the Houston Museum of Fine Arts during the opening of the Cyrus Cylinder’s tour of the United States. This entry was posted in Documentary, Location Sound, Uncategorized and tagged Canon 5D, Citizen Doug Productions, Cyrus Cylinder, Cyrus Cylinder U.S. Tour 2013, documentary, Heritage Foundation, Houston Museum of Fine Arts, IHF, Julye Newlin Productions, Lectrosonics, location audio, location sound, MFAH, opening, record, recordist, short film, sound devices 552, United States Tour. Bookmark the permalink.